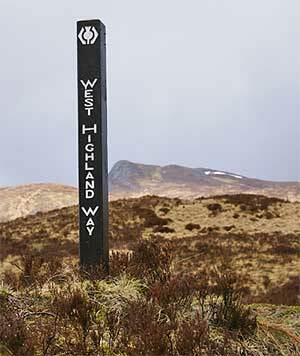 The West Highland Way was first opened in 1980 and became Scotland’s first Long Distance footpath, the path stretches 95 miles from Milngavie north of Glasgow and ends in Fort William in the foothills of Britain’s highest mountain Ben Nevis. 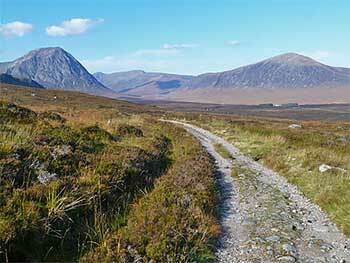 The walk is Scotland’s most popular long distance footpath and consists of some of the greatest scenery in Scotland whilst remaining a footpath that can be done with relative ease, with many facilities along the route, it can be completed by anyone with decent planning and the correct walking gear. It can become fairly busy during the summer months, but can be achieved all year round. Along the ancient drove roads which the highlanders used to reach the lowlands with their cattle to sell at the markets and the Eighteenth century military roads built to control the Jacobite revolution, walkers will see stunning Scottish scenery and an abundance of Wildlife including Scotland’s Red Deer and soaring Golden Eagles. Beginning through the lowlands of northern Glasgow the route follows the east shores of Loch Lomond and over the Highland Boundary Fault Line, it then passes Crianlarich heading across the open moorland of Rannoch Moor. 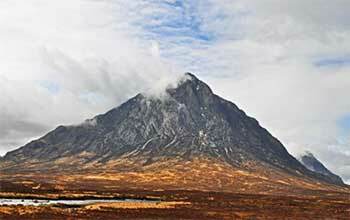 The route will then pass close to Glencoe notorious for the massacre of Glencoe, before reaching Fort William. The route is mainly following paths along the rugged wilderness of Scotland apart from the sections close to Loch Lomond and Bridge of Orchy that are in close extremity to the main roads, so you should be always prepared for any dramatic changes in the Scottish weather. Although this route is not the most difficult long distant path and passes by some of Scotland’s highest mountains rather than walking over them, a decent amount of fitness is still required because of some fairly steep ascents. On average it can take six to seven days to walk the West Highland Way, this gives you the perfect excuse to make it a week’s holiday. During busier times it is easier to find your accommodation by avoiding a Saturday start. Many people will do the route from the south to north and will average between ten-14 miles per day. There are many accommodation types on the way including B&B’s, hotels and Bunkhouses. Some people prefer to camp but this will involve carrying more equipment, if you wild camp in Scotland please follow the outdoor access code and camp responsibly. If you are looking for added challenges why not add to the route a climb up Ben Nevis or Ben Lomond along the way, or if you are looking to experience individual parts of the route without doing the whole thing you can try short walks up the Devils Staircase at Glencoe, this section of the route is very much a spectacular part of the walk.